Large archive of over two hundred (150) Manuscript Documents Signed, broadsides, Autograph Letters Signed and partly-printed Documents Signed pertaining to the Parrott plantation in Loudon County, Virginia, covering a 60 year period, starting in the 1840’s. Hiram Parrott served in the 35th Battalion of Virginia Cavalry after enlisting shortly after Gettysburg on August 1, 1863. He would serve with this unit until it’s surrender and his parole at Gordonsville, Virginia, May 25, 1865. In April 1865, the 35th battalion was the rearguard as the Army of Northern Virginia retreated up the Appomattox River. Just prior to Gen. Robert E. Lee's surrender at Appomattox Court House, members of the 35th served as couriers delivering General Ulysses S. Grant's surrender terms. Lt. Colonel White and the 35th did not surrender with the rest of the army, but instead rode around enemy lines and returned to Loudoun County, where they disbanded. 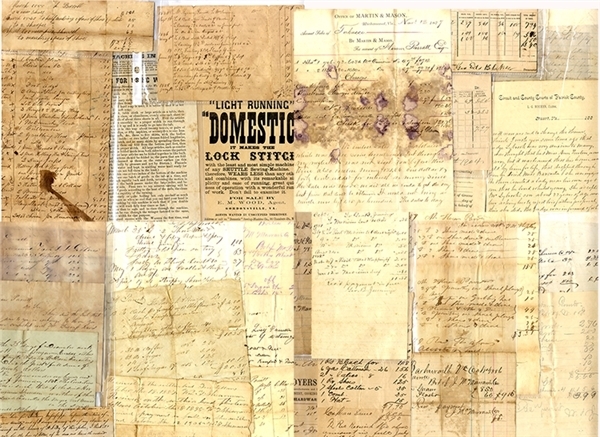 This large archive consists of several slave documents, one of which is war-date, letters pertaining to and dozens of others pertaining to stores or goods for the operation of their plantation. Condition varies from fair to fine. A nice large archive of material pertaining to this Confederate soldier and his family estate.